I have suffered from acne for so many years and tried almost everything. Here you can read all about my acne journey to a clear skin. Right in the beginning I want to confess something. I postponed this post quite a bit. I was planning on doing it, but I kept putting it off and when I got a red pimple right on my chin, I thought: damn, now I have to wait until it’s healed. But then I thought: no I don’t. It’s reality. It’s my actual skin situation at the moment. Pimples and what not. My blog has always been about skin positivity and embracing what you got. 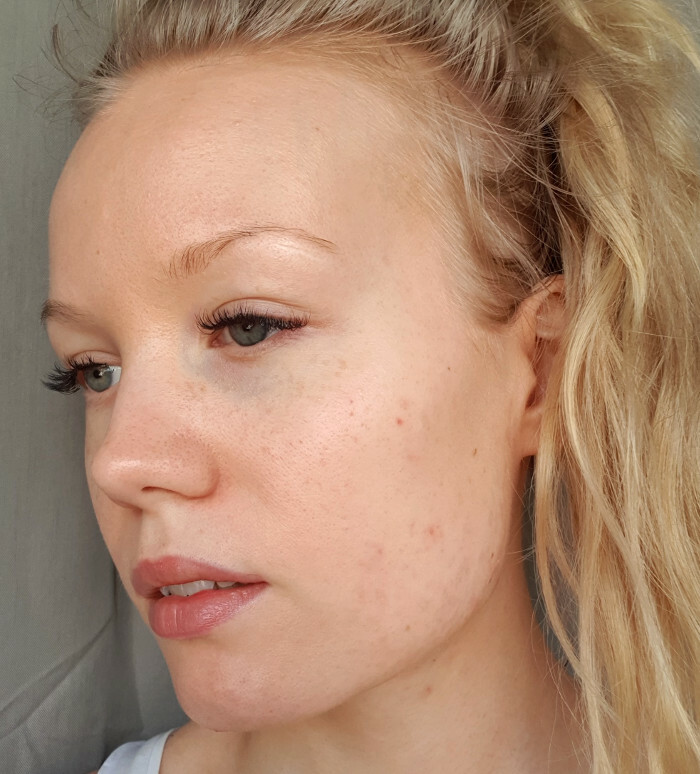 I’ve been sharing some horrible acne pictures here and telling you and myself: it’s okay. You’re still beautiful. Your skin doesn’t define you. It’s funny how even after all these years of acne – or maybe because of them – I am still insecure about my skin sometimes. So with this post I’m also reminding myself: having one pimple is not the end of the world. Besides, in comparison to what my skin has been at it’s worst, I’m super happy with my skin and I really appreciate it (and the pills that help). 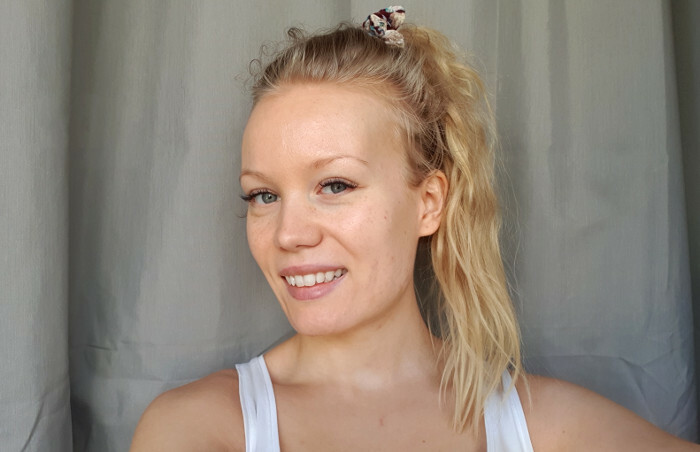 My latest skin update was this post, when I had taken six months of birth control pills. When nothing else worked for my acne, I started those pills. The pills (Diane Nova or Cypretyl) worked very fast and well. I did not have any side effects either. Quite the opposite: my skin was beautiful, less oily and my period pains were nonexistent. 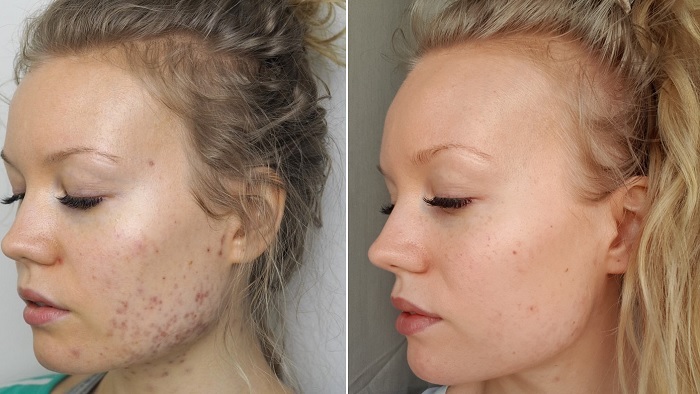 After about a year my acne was completely gone (except a few deep spots on my chin that are so stubborn) and I switched my pills to Yasminelle, which are not as strong as Diane Nova pills are. I’ve now taken Yasminelle for a few months and while I have noticed a change in my skin, the condition of it is still pretty good. It’s not as good as with Diane Nova, but I expected that. I’ve had these pills before so I’m familiar with them and know that they do maintain my skin in a pretty good shape. They keep the acne at bay, so to speak. They also suit me well and help with the period pains. But one thing I do have to say, is that I do notice some mood swings and I think it’s because of my hormone levels changing quite a bit after first taking Diane Nova and then switching to milder pills. My skin is doing pretty good right now. I’ve noticed some texture and a few pimples, but I’m trying not to worry about it. Easier said than done! Those few deep spots on my jaw for example are so annoying. They are in a difficult spot and I can’t really do anything to them myself. I’m actually thinking of going to a beauty therapist to take care of them. But we’ll see. I also get pimples on my decollete and back, but so far it’s very minimal. I knew to expect some change in my skin after switching up the pills. Because, sadly, I’ve already gone through the process once. When I was a teen I started Diane Nova pills and ate them for five or so years and then switched to Yasminelle. Right now I’m trying to keep my routine gentle and I’ve found that good hydration is key to a healthy skin. It’s a bit too easy to fall far that heavy cleansing and exfoliating when suffering from skin problems or changes, so I’m trying to steer clear from all of that. After all, my skin can be a bit sensitive and it’s no wonder, after all the heavy medications it has gone through. I still have acne scarring on my jaw, but it’s not that visible or as bad as I expected it to be. I’ve found that the best things for acne scars are Drops Of Youth Serum, argan oil and protecting the skin from the sun. More on all of those below, on my blog posts. This is my favorite serum – because it works. I recently shared my routine in the post linked above. I also talked more about hydration and moisturizing – there’s an important difference. I also do a mask once per week. I’ve found that chemical exfoliation is the best for my skin – it’s effective but gentle. I especially love that Radiant Glow mask. Madara’s sunscreen also gives a nice glow to the skin! Well… first of all, it’s been three months since that update. And since then, my skin has actually, really, improved. To the point where I would even use the word flawless for it. Today, I can honestly say that my skin looks so good. No acne. I still have the occasional pimple – mostly on my back – but I think it’s getting better. Though there are days, when I lose my nerves with my back acne. Treating my back seems to be an impossible task compared to my face. I wouldn’t necessarily say that my acne is cured, as I feel like I’m medicating it. I’ve been taking birth control pills for almost six months now. The pills I take are called Cypretyl and they are (I think) the strongest, and usually prescribed for acne. I am so happy I made the decision to start taking them again, because my skin problems have had a serious impact on me (and not the least, because it was physically painful). I don’t have any side effects from the pills. Actually the opposite. I used to suffer from killer periods – and now I can manage. Also – don’t mind me looking like a completely different person here… Besides my acne being gone, taking botox has changed my face quite a bit. Read about the botox here. How do I treat my skin? Besides the pills, I also have some skincare products, that I blame (ha ha) as well for my now smooth skin. I wrote about The Body Shop’s Drops of Youth -serum, which I still use and warmly recommend to anyone suffering from uneven skin and pimples. I also love these three products from Lavera, that I wrote about. Especially that cleanser and day cream – so good. I do a mask once a week and usually I use one from Madara. And to get an idea of my routine, here is my old skincare routine from March. Obviously the products have changed now. Are there any of you taking birth control pills for acne as well?